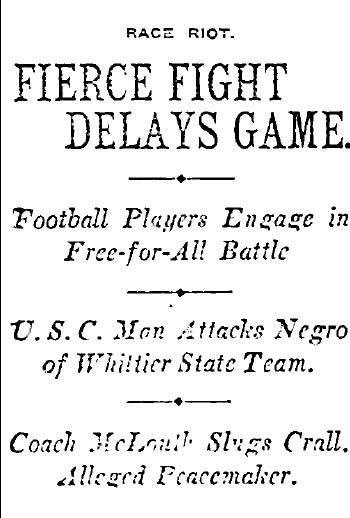 Mr. Woolin, left tackle of the USC team, took great exception to be tackled by one of the black players on the Whittier State team (one of Whittier’s five black players) and voiced his displeasure, emphasizing his point with his fist. Whittier’s coach, Mr. McLouth, rushed to intervene, whereupon Mr. Woolin further expressed his disdain by striking him in the face. Coach McLouth responded in kind. Peace was eventually restored until Whittier’s water boy came onto the field and retaliated against Mr. Woolin, and had the Whittier team not retreated from the field, the unpleasantness might have continued. 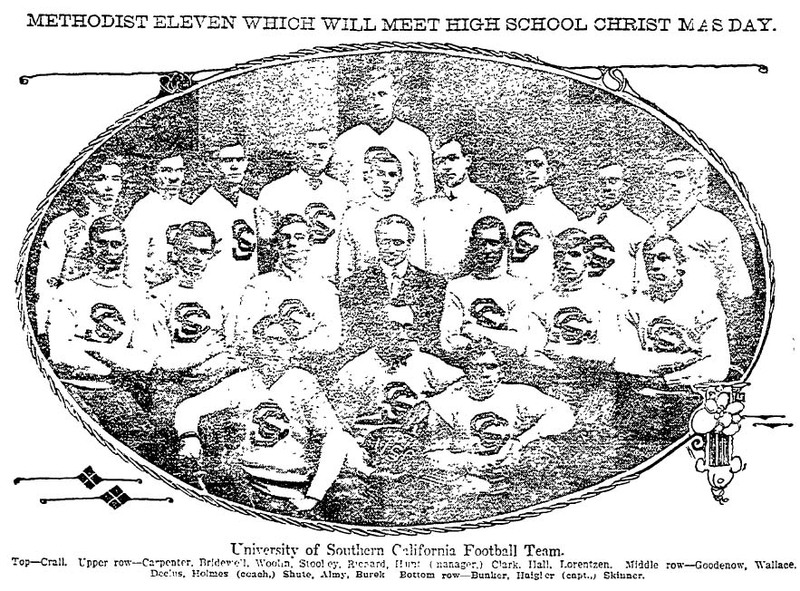 As the score was 37-0 in favor of USC and the visiting Whittier team needed to catch the streetcar home, the game was halted 15 minutes into the second half. Here’s to Brice Union Taylor, who in 1925 became USC’s first All-American player. He was later a pastor at First African Methodist Episcopal Church in Los Angeles. By the way, he only had one hand. This entry was posted in 1907, African Americans, Sports, Streetcars, Transportation and tagged #USC, 1907, African Americans, racism, sports, Whittier. Bookmark the permalink.